Savannah, GA, October 5, 2013 – Royal Restrooms of Savannah partners with the Lowcountry Down Syndrome Society for the 2013 Buddy Walk in beautiful Forsyth Park. 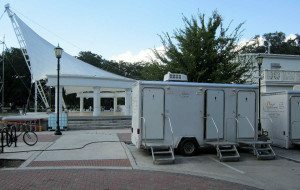 The Buddy Walk was proudly served once again by Royal Restrooms of Savannah with a three-s tall portable restroom trailer as well as an ADA-compliant restroom trailer. Many thanks to all the supporters who made the 2013 Buddy Walk a success and to LDSS for including Royal Restrooms in this amazing event. Family fund raising events need restroom facilities suitable for all guests, especially children. Soap, paper towels, running water, climate control, and plenty of space are just some of the basic features that make Royal Restrooms a sanitary and comfortable rest stop for families during any event. ADA restroom trailers with ramps provide easy access for guests with disabilities and allow moms to conveniently wheel strollers into the restroom. See more amenities here or request a rental quote. 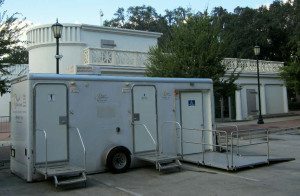 Contact us at 800-969-7434 to learn more about portable restroom trailer rentals for fund raising events or find your local office here.